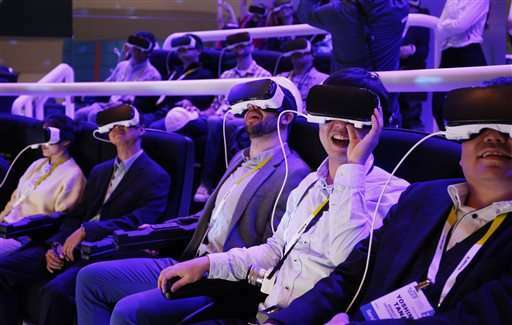 It doesn't take a high-tech headset to see that virtual reality is the rage. It's being touted as the future for all things sensory, from games to film and television, from storytelling to visual art. My response as a television critic—and as a dyed-in-the-wool TV viewer—is to ask what this all means to me. I am not typically an early adopter. My beat as a journalist isn't newfangled gadgetry. I'm a TV-centric content guy, scrambling to keep up with the torrent of programs that, however more plentiful and varied their providers, still contain themselves in two dimensions. Even so, VR seems a force to be reckoned with. So I grabbed a Samsung Gear VR headset for a maiden voyage. Virtual reality is the link to an alternate reality, and instantly I'm all in! For example, I find that a wooded, birds-twittering forest on a sunny day is a far more agreeable environment than my stuffy apartment. And that's even before Reese Witherspoon appears over a rise and, puffing with her backpack, rests herself on a nearby rock. In character from her 2014 film "Wild," she is bedraggled but radiant and seems close enough and real enough to bother for a sip of her water. Alas, all too quickly Witherspoon resumes her solitary trek, vanishing through trees in the opposite direction too absorbed in her odyssey to have paid me any notice. But a dinosaur does. With "Jurassic World: Apatosaurus," I am in a different kind of forest, stationed a few yards from a colossal dozing reptile sprawled on the forest floor. Then, during this two-minute interlude, it blinks awake, clambers to its feet, spots me and, staring me right in the face, takes a curious sniff. These adventures pale in wonder to Cirque du Soleil's "Kurios: Cabinet of Curiosities," which sweeps me into a wondrous spectacle. Beautiful and dazzlingly weird, the dozen-and-a-half performers cavort on a stage where they accept me as a spellbound intruder. They put on quite a show. Or, maybe more accurately, many shows. As I share their 360-degree space, where and what I look at is up to me. I am free to bob and swivel my head to fix my gaze on anyone or anything. I literally get to call the shots. And after a half-dozen viewings, with my attention leap-frogging from one direction to another, I still can't take in all the revelry. If joining a famed entertainment troupe is remarkable, an even bigger blast is gaining entry to a painting by Vincent Van Gogh. Thanks to a VR reimagining of Van Gogh's 1888 "The Night Cafe," I can take my place within the brushstrokes of the Café de la Gare and its scattering of tables and chairs, billiard table and lone patron come to life. But there's more to explore than the single room the painting has immortalized. Through a doorway in the corner, I can stray into a never-before-seen side room, where a pianist plays a melancholy tune and—lo and behold—Vincent himself sits listening while meditatively smoking his pipe. Unlike VR video captured with stationary 360-degree cameras, this Van Gogh tribute is more like a video game, letting me interact more authentically with my surroundings. I can step up to a table or a person, but no farther, as if these objects were really in my way. And unlike many VR experiences, this one is open-ended. I am free to linger in this otherworldly, painterly realm to my heart's content. At this cafe, there is no last call. And I am in no hurry to leave. Why would I? Despite the possible onset of a headache or queasiness (nothing comes without a price, including this technology in its infant stage), VR is a habitat of countless possibilities, an exhilarating refuge that yanks me from the sidelines and thrusts me into the action. Could VR ever become the default mode for its audience? I can imagine a time when immersion in VR might be as normal a state of self-imposed isolation as earbuds piping music from an iPod is now. But more pertinent to me, a television guy, is this question: As VR evolves as technology and art, what will be its impact on the act of vegging out with old-fashioned TV? Television has long reigned as the province of the couch potato, viewing passively while free to do other things: answer email, fix a snack or just nurse a beer. But lost in VR's altered state, I could easily miss my mouth when trying to take a sip. VR demands full commitment. Could be, as VR comes of age, television will become not quite old hat, but instead what radio became with TV's birth: an atmospheric add-on, just one part of the everyday sensory mosaic. Similarly, TV, with its grip on public consciousness downgraded, might be recast as an omnipresent supplement to real life. Not supplementing, but supplanting real life: That's what VR aims to do.